My name is Big, Big McLargehuge. I'm the Ultra Commuter of BikeCommuters.com. All these other pansies on this site don't commute nearly as much as I do. In fact some of them even own cars! I don't have a car, it's probably because the Law says I'm not allowed to drive on the road...but whatever. Our grandparents and their grandparents have witnessed the massive development in transportation means. In 1769, mankind witnessed the invention of the first steam-powered automobile by Nicolas-Joseph Cugnot. And only after 48 years, we adopted a new transportation tool – a bicycle. After some time bicycles lost their popularity and were considered as children’s transportation mean. Kids love cycling because it’s fun, they spend their energy, they move around, they are active and feel great after a short cycling session. We basically pointed out all the benefits to biking, but there’s more to say. Biking is simply a fun activity. It’s correlated with childhood memories and games. You could still have fun while biking as an adult. You get to observe the streets you pass by, hear the daily sounds, encounter animals and birds, and integrate with nature. Children love observing their surroundings. To have more fun you need to keep your inner child and find happiness in the simplest things. Biking to work is good for your physical health. First of all, you are saving money on your gym membership. Secondly, you are getting in shape. Even if biking is a simple cardio and leg workout, and doesn’t necessarily mean you’ll build your ideal body, it’s still a healthy way of transportation. Biking burns a lot of calories and prepares your heart for other cardio exercises in the future. You can, of course, start jogging to burn calories and fat, but biking is better for your joints too. By biking every day to work, you can improve your cardiovascular fitness, lower the blood pressure and boost energy. You will be able to build a stronger muscle tissue and improve coordination. Isn’t it dreamy? To have a practical and beneficial transport all in one. Buy a bicycle once and stop worrying about your transportation costs. Leave the worrying to personal car drivers. The gas price keeps rising, and driver’s wallets keep thinning. On average, people spend half of their salaries on gas money. The public transport users are also in a bad image when it comes to saving money. Yes, it’s better to travel by public transport, but you still need to pay money for the services and keep up with other people too. Of course, there’s carpooling, but it’s for another cause. You could still look up carpooling benefits and see how you’d like to share the cost of transportation. The average cost of maintaining a car in a good condition is between 9000 – 10 000 US dollar a year. And it differs from men to men. Bike owners only spend 300 – 500 US dollars a year to maintain their bike’s good condition. Not to mention the huge difference between a car and bike repair costs. When you are biking to and from work you find opportunities to enjoy the commute more by seeing the changing of the seasons or finding pop community events happening. These unplanned perks can help you actually look forward to commuting each day. We already mentioned that biking to work is good for your fitness activities. But what about those people who want to lose weight and get in shape? Most people don’t have time to visit the gym daily or at least three times a week. Biking to work every day is a great substitute for an hour on a treadmill. Biking will help you lose some weight and become fitter. What’s more pleasing to hear than this? While cars and buses stay in the traffic jams on busy hours, you can safely drive on bike lanes and go home in time. Car drivers will envy you for such flexibility. What else is there to tell you that will help you decide to try biking to work? You’ll be able to experience all the benefits and advantages of biking while going to work. Finding a reason not to do something, according to psychology experts, is easier than finding a reason to get involved in something. Cycling has become a sort of fashion in the 21st century, with better models of bikes that make riding as normal as it would be. There are many people who do not ride, simply without no reason. You probably had a negative rumor that scared you off, or you simply do not know how riding can couple up with your life. In most urban environments, nightmares happen every morning. Traffic jams are one of the most annoying factors that lead to a gloomy day for most people. Misfortunes start on the traffic snarls. The boss yells at you, your workload piles as you try getting to work, your rear lights get bumped by the drunk driver behind you, and you end up with a ticket for driving without your tail lights. Well this catastrophic phenomenon can be sorted out by a simple solution of paving your way through the thick traffic on your bike. One of the best things that would happen to you. You will pity the guys stuck in traffic, you will get to work feeling refreshed, and your boss will shine his light upon you. The best thing for you is that, you will have a peaceful day, and you will live to see a clean in-tray. The last time you checked, the mileage of your car seemed to be playing tricks on your vision. Every time you start your vehicle, you cannot help but think how nasty the resale will go for you. Well, here is a quick way to help yourself out on this. A bike will sort the mileage out for you. In case you think riding is not as significant as it can get on your car’s value, do a simple calculation of the distance you cover every day, for 5 years. That way, you will find that a bike to save the lifetime of your car can help you. Furthermore, the maintenance is lessened, the gas prices are not a morning sickness for you, and there won’t be any tickets for a broken tail light. This may strike you as a funny misconception but it is true. The physical strain that your heart endures to keep your circulation during the panting moments while you ride, helps your heart muscles to wax stronger. More to that, you reduce the chances of exposure to cardiovascular diseases, heart failure, or stroke. Your blood circulation remains great, and you enjoy a longer life. You never thought you could achieve that on your Danish Bike? You probably never got to know where the lady you always bump at the grocery store lives. Here is the chance to know who lives around you, security is paramount in times when terror attacks are planned in homes, so you might want to know how safe your neighborhood is. Riding around your neighborhood every day, chances are that you may not miss a chance on one of those rides to know something about a person living near you. Ever thought of shredding some weight without having to face the “no pain, no gain” mantra that most fitness gurus chant? Bike riding is one of the most effective ways that can help you keep fit, without you thinking about it. Your weight just slides off the scale, though it may take a little longer. Taking off on a ride, on a dull Saturday evening may be the champagne pop that your family has waited for all this long. Bonding is one of the valuable moments that a family can settle differences. A ride around the neighborhood will ignite a sense of belonging for your family, and chances are that, you will enjoy each other’s company after the ride. It may well be a much-loved destination among beach lovers and sun seekers, but Tenerife is also perfect for pedal-power enthusiasts wanting a thigh-burning getaway. Along with its bike-friendly cities, you can also enjoy pleasant temperatures, varying degrees of difficulty, and some stunning landscapes as you pedal your way around this volcanic island. BikeCommuters.com has previously looked at how Tenerife’s rugged terrain is well suited to mountain biking. But this time around we are going to concentrate on its superb road network, which has played host to the training camps of several pro cycling teams. A gentle introduction to Tenerife, this route goes through the island’s fertile farming area and includes an overall altitude climb of just under 2,000 feet. You should start at Palo Blanco before heading on the TF-326, which will take you to the village of Benijos. Keep going until El Camino de Chasna and then turn left onto the TF-21, which descends down into La Orotava. Winding its way along the southeast area of Mount Teide, this route contains plenty of turns and is relatively flat but reaches a height of just over 1,640 feet. From Granadilla de Abona, take the TF-28 through the quaint little villages of Chimiche, Arico, and Fasnia. Just after you pass through Guimar, branch left onto the TF-525 towards Arafano and you’ll soon be back where you started. Cycling up Mount Teide isn’t easy, but this is perhaps the most obvious route to climb the 8,000 feet to the island’s highest point. You can take the TF-21 from Puerto de La Cruz straight to the base of the mountain. Along the way, you will bare witness to some stunning sights including pine forests and Teide’s famous lunar-like landscapes. If you need a break, visit the village of Aguamansa before continuing to El Portillo. With its consistently mild climate, you are virtually guaranteed good weather all-year round in Tenerife. But soaring temperatures at the height of summer combined with increased traffic on the twisty mountain roads will test even the most accomplished and adept cyclist to set foot on the island. There is no reason why you can’t explore Tenerife on your own or with a group of friends, but if you want a little more reassurance, there are plenty of tour operators that can provide everything from bike hire to guided tours and even seminars on how to cycle like a pro. When it comes to mountain biking, Tenerife has a strong claim to the title, ‘King of the Canary Islands.’ The island’s relatively compact geographical area works only to its advantage, as you don’t have to travel far between areas to find all kinds of biking routes. From winding mountain roads to forest trails to coastal tracks, there is plenty of exciting terrain to choose from. With little variation between summer and winter, Tenerife is warm all year round, so you don’t have to worry about encountering foul weather. Even in the winter months, rain is minimal. The south and the west are the warmest regions, but of course, on Mount Teide, you can expect colder weather and even snow in winter. After all, it is 3,555 metres high! No matter where you go mountain biking on Tenerife, you’ll encounter incredible views. The north, however, is where you will find some of the most breath-taking, rugged mountain scenery. The Esperanza forest area is one of the most popular amongst mountain bikers. The trails will take you through gorgeous pine forests, and any uphill climb will end in a worthwhile view over the surrounding area. For the more recreational cyclist, the forests in the Vilaflor area in the south of the island are a great place to start out. The trails are wide, the terrain good, and there are few steep inclines. Vilaflor is the perfect place to take the family if you want to go biking with the kids. Less experienced riders can also take advantage of the island’s bike tour operators, if you’d rather travel with a guide. Lavatrax and Bike Point are two of the most popular operators, offering days out on a range of routes, with bike hire included. You shouldn’t mistake Tenerife for a tourist-only cycling destination. If you’re an experienced mountain biker and you want to challenge yourself, you could take the winding road to La Masca. This tiny village is nestled high on a mountainside, and it is one of the most picturesque locations on the whole island. You’ll start the route in Santiago del Teide, in the west of the island. The steep, narrow road to the top is not for the feint hearted, but Masca is worth the ascent. Most levels of cyclist can manage the route to the summit of El Teide. Despite being the highest mountain in Spain, the trail is not too steep. Cycling is a fun alternative to climbing the mountain on foot. If summiting the peak isn’t enough, you can explore the surrounding Teide National Park by bike as well. Where are your favourite mountain biking holiday destinations? Let us know in the comments below! Image by cédric used under Creative Commons licence. Spain is a destination endlessly popular with cyclists. Its excellent climate, beautiful natural landscapes, and bike-friendly cities make it the perfect holiday location for travel hungry cycling nuts all around the world. For a truly special two-wheeled tour, though, head to the south east of Spain and the hip, hot and happening coastal regions of Valencia, Murcia and Andalusia. And don’t worry: with some careful planning, you won’t have to go through the rigmarole of hiring once you’re there. Pack smart and you can take your own bike with you on your epic Spanish odyssey. First things first: read the small print. Even if an airline is offering cheap flights, they may charge you a high fee to check your bike, so it’s worth shopping around for the best deals. Though it can be tempting to box up your bike and claim it’s just a regular old piece of luggage, this will prevent you from claiming any insurance if the bike is damaged during transit. As for the actual packaging, it comes down to three options. Firstly, you could choose a soft bike case or plastic bag. Bags are cheap and flexible but don’t offer much protection from overenthusiastic baggage handlers. Secondly, you could invest in a sturdy rigid case. This will definitely keep your bike safe, but is also the most expensive option and difficult to transport once you’re off the plane. Your third option is a cardboard box, which strikes a happy medium between the other two, giving adequate protection to your bike without being too expensive. Best of all, you can maintain your green credentials by recycling it once you get to your destination! Some of the best cycling to be found in this part of the world is in Murcia. This university city boasts numerous cycling trails and fascinating sights in the centre of town, including an ornate cathedral, a large botanical garden and park, and a spectacular world-famous casino in the Sociedad Casino of Murcia. 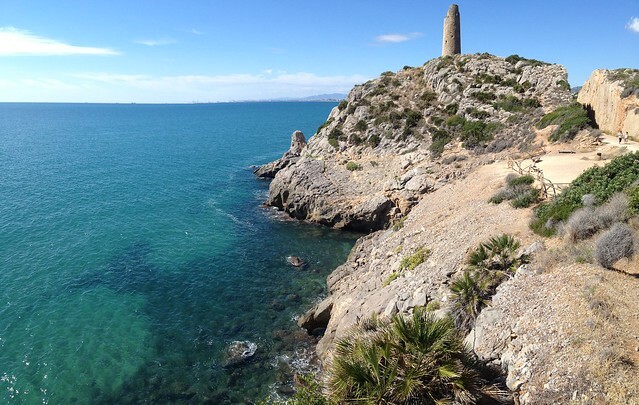 Further south from Murcia, the coastal cities of Almeria and Cartagena provide ample opportunities for cycling. The notoriously dry Almeria is particularly pleasant for tranquil bike rides during the cooler autumn months. Meanwhile, Cartagena is the place to be if you’re into your historic architecture. The city is home to an ancient Roman theatre, the ruins of a cathedral destroyed in the Spanish Civil War, and a number of striking Art Nouveau buildings. Around the south east of Spain, there are numerous disused railway tracks, which have been converted into cycling paths. Known as “greenways” or via verdes to the locals, these paths are a secluded and truly unique way of travelling through Spain’s natural landscapes. If you’re headed for Valencia, take a train down to Gandia and hop on the Safor Greenway, a long straight cycling path that takes you past orange groves, canals and rural villages. From Murcia, you can head west inland on the Greenway of the Northwest, a 78 km line that links Murcia with Caravaca de la Cruz, one of the Holy Cities of the Catholic Church and a place famous for its spectacular 15th century castle. For cyclists who want to make the most of Spain’s sandy beaches and warm waters, there are plenty of coastal routes to choose from. If you’re feeling particularly adventurous, fly into Valencia and then make your way down the coast to Malaga. You’ll pass through the beach resort towns of Benidorm and Alicante (where you can get your sunbathing and clubbing fix) before reaching the Murcian towns of San Javier, Cartagena and Aguilas. Once in Andalusia, head south along the coast to spots such as Carboneras, home of the famous Playa de los Muertos beach. Move on through the fishing village of San Jose, before finishing up in Almeria. Trust us – the journey will be tough on the legs but easy on the eyes! The real beauty of taking a cycling tour of south east Spain is that it’s very easy to get budget flight deals, particularly if you travel off-peak. If you take your bike as well, your travel costs once you arrive will be dramatically reduced, which means more money for sightseeing, tapas and lots of cold Spanish beers.